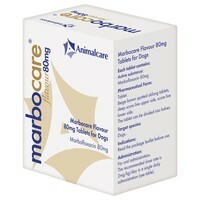 Marbocare Flavoured 80mg Tablets for Dogs is for the treatment of skin and soft tissue infections, urinary tract infections and respiratory tract infections in dogs. Each tablet contains 80mg of marbofloxacin. The tablets should be administered orally by hand or mixed in with food if necessary.